Posh celebrate yet another win over Northampton. Posh have 17 League One matches to go starting with a tricky trip to in-form Gillingham on Saturday (February 10). 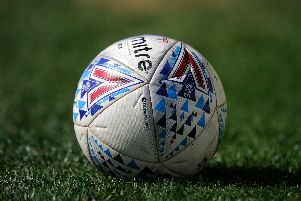 The average points tally achieved by the team finishing sixth in League One (the final play-off place) over the last decade is just over 74 points. Jack Marriott scores for Posh at Charlton. But I reckon 70 points will be plenty this season as some of those fighting for a top six place like Bradford City, Portsmouth and Charlton have been in stuttering form. That means another 27 points from 17 games and I am certain that’s possible. Here’s how it will/could happen and it involves Posh staying unbeaten at home for the rest of this season which is admittedly a big ask on current form! Posh have often looked more solid on their travels. Posh will have to get past former defender Gaby Zakuani at Gillingham on Saturday. Strong opponents have often brought the best out of Posh. I still fancy Pool will get relegated. Posh have struggled against the strugglers. Posh were robbed of victory at Walsall. The Shrews have been grinding out wins all season. 8) v Bury (away) D0-0. Posh rarely play well at Gigg Lane. A tricky awayday against a team who won easily at Posh. The Millers are a strong side with goals in their line-up. Posh always beat Northampton under Grant McCann. Dale are going down and Posh can help them on their way. Rovers are going up and Posh will find it tough up there. Posh to beat a team with nothing to play for. Could be a big game at the end of the season. My top six prediction: 1 Wigan, 2 Blackburn, 3 Shrewsbury, 4 Rotherham, 5 Scunthorpe, 6 Posh.